Posted on 5 March, 2018 . Part of our model of leading as a host is the idea of four positions – In the spotlight, With the guests, In the gallery and In the kitchen. These are four different ‘places of perception’, viewpoints that a host leader can take to get different interactions and possibilities going. With skill and practice, you can learn to move very quickly between them. It’s rare to find someone as skilful at this at Steven Devlin from the Rocpool Restaurant, Inverness in the North of Scotland. I’ve just returned from a trip up north to celebrate a family birthday. Jenny and I were staying at the Palace Hotel – we’d gone a day earlier than planned to avoid incoming blizzards here in Edinburgh, and so arrived in search of a good meal with no particular plans. The Rocpool was very close by and well reviewed, so we dropped in at 7pm on a cold Wednesday evening and… it was packed! Fortunately the lively Maitre’D quickly had us at the bar getting a drink and a table came free, so we sat down. 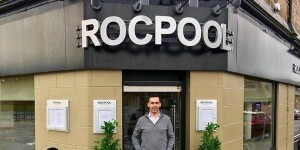 Steven Devlin (pictured above outside the restaurant) is more that just a Maitre’D – he is the owner, and the inspiration behind this restaurant. After 16 years of success, Michelin listings, Good Food Guide recommendations and AA rosettes he knows what he is doing. And one of the things he is doing is being incredibly observant as he moves about the restaurant. He took a little time to chat with us and find out how come we were in town. As the evening went on, he quickly noticed again and again when we had an empty glass, or if something hadn’t arrived yet. And it wasn’t just us – walking through the restaurant, I could see that he was quickly noticing where every table was, how things were going, what needed to happen next. Steven is no one-man band of a restaurateur; he has many very well-trained and skilled staff both waiting tables and in the kitchen. However, he sets such a great example with his observation skills that it gives the whole place a wonderful atmosphere of inclusion and care. In terms of our model of host leadership, he is In The Gallery all the time, being aware of what’s happening, how things are going, what needs to be taken care of next. And then he can swiftly move into being With The Guests as he talks to each party and moves things along. As you do this, you’ll notice things to respond to – good and not so good. Respond right away. Then move on quickly. There are always more things to notice and more people to engage with. We liked watching Steven, the vibe and the food so much that we returned two nights later for our birthday celebration meal. And of course Steven was at it again. Always interested, always observant, always moving. A great example, and a great host.